The cloud is now the center of most enterprise IT strategies. Many enterprises find that a well-planned “lift and shift” move to the cloud results in an immediate business payoff. This whitepaper is intended for IT pros and business decision makers in Microsoft-centric organizations who want to take a cloud-based approach to IT and must modernize existing business-critical applications built on Microsoft Windows Server and Microsoft SQL Server. 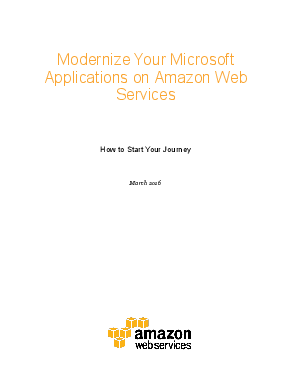 This paper covers the benefits of modernizing applications on Amazon Web Services (AWS) and how to get started on the journey.